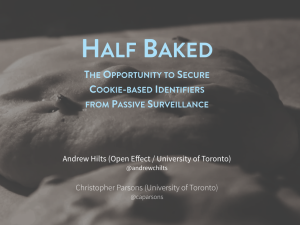 Andrew Hilts and Christopher Parsons have released a new paper that is titled “Half-Baked: The Opportunity To Secure Cookie-Based Identifiers From Passive Surveillance.” Cookie-based identifiers are used by websites to deliver advertisements as well as collect analytics information about website visitors. Incidentally, intelligence agencies such as the NSA, GCHQ, CSE, and other Western signals intelligence bodies use the same identifiers to track the activities of individuals and their devices as they access, and use, the Internet. The paper respond to a series of basic questions: To what extent do major online properties encrypt the advertising, cookie, and other digital identifiers used by the NSA and other intelligence agencies to track users and their devices around the globe? Since the Snowden revelations began have providers actually encrypted more, or less, of these identifiers? Documents released by Edward Snowden have revealed that the National Security Agency, and its Australian, British, Canadian, and New Zealand equivalents, routinely monitor the Internet for the identifiers that are contained in advertising and tracking cookies. Once collected, the identifiers are stored in government databases and used to develop patterns of life, or the chains of activities that individuals engage in when they use Internet-capable devices. This paper investigates the extent to which contemporary advertising and analytics identifiers that are used in establishing such patterns continue to be transmitted in plaintext following Snowden’s revelations. We look at variations in the secure transmission of cookie-based identifiers across different website categories, and identify practical steps for both website operators and ad tracking companies to take to better secure their audiences and readers from passive surveillance.